In this paper, we introduce a hierarchical framework for the quantitative performance evaluation of mobile-agent middleware platforms. 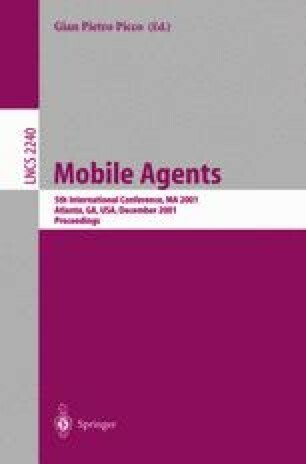 This framework is established upon an abstraction of the typical structure of mobile-agent systems and is implemented through a set of benchmarks, metrics, and experimental parameters. We implement these benchmarks on three mobile agent platforms (Aglets, Concordia and Voyager) and run numerous experiments to validate our framework and compare the mobile-agent middleware environments quantitatively. We present results collected from our experiments, which help us understand MA performance and identify existing bottlenecks. Our results can be used to guide the improvement of existing platforms, the performance analysis of other systems, and the performance prediction of MA applications. This work was supported in part by the Research Promotion Foundation of Cyprus, grant PENEK-No 23/2000. Mitsubishi Electric ITA. Concordia Developer’s Guide, October 1998. http://www.meitca.com/HSL/Projects/Concordia.